Michalska M, Kazimierczak W, Leszczyński W, Nadolska K, Bryl Ł. Contemporary follow-up imaging after endovascular repair of lower extremity atherosclerotic lesions. Polish Journal of Radiology. 2018;83:521-529. doi:10.5114/pjr.2018.80348. Michalska, Marta, Wojciech Kazimierczak, Waldemar Leszczyński, Katarzyna Nadolska, and Łukasz Bryl. 2018. "Contemporary follow-up imaging after endovascular repair of lower extremity atherosclerotic lesions". Polish Journal of Radiology 83: 521-529. doi:10.5114/pjr.2018.80348. Michalska, Marta et al. "Contemporary follow-up imaging after endovascular repair of lower extremity atherosclerotic lesions." Polish Journal of Radiology, vol. 83, 2018, pp. 521-529. doi:10.5114/pjr.2018.80348. Atherosclerotic disease is currently one of the most important problems of modern medicine because it is a leading cause of increased morbidity, morbidity and mortality, and disability in the Western World. Atherosclerosis of the lower limbs (peripheral arterial disease – PAD) significantly affects the quality of life and in a considerable proportion of patients is a cause of disability. Radical treatment of PAD, both surgical and endovascular, aims at revascularisation of ischaemic tissues distal to obstructed arteries. Surveillance imaging is an important part of patient management after endovascular repair of PAD. Apart from availability and contraindications, challenges of imaging include calcifications, flow dynamics, and stent-related artefacts. The aim of this paper was to review the current literature on imaging methods for follow-up after endovascular repair of atherosclerotic lesions, with special attention paid to novel techniques. As a non-invasive modality, ultrasound is still the first-line examination, but computed tomography angiography remains a current state-of-the art technique for follow-up. 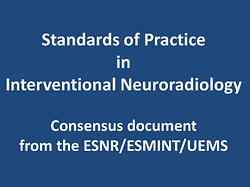 However, since current imaging recommendations seem not to adhere to contemporary imaging possibilities, more attention should be paid to recent improvements in magnetic resonance angiography technology.